On September 28th, Fredericton Raceway celebrated 125 years of harness racing and the fact that it has sustained itself for this long in the New Brunswick capital is a noteworthy achievement in this age of racetracks closing their doors. Fredericton Raceway has celebrated many accomplishments during those 125 years including a world record and many Canadian records. In fact it once owned both the Canadian trotting and pacing records but it is also known for other notable happenings as well. 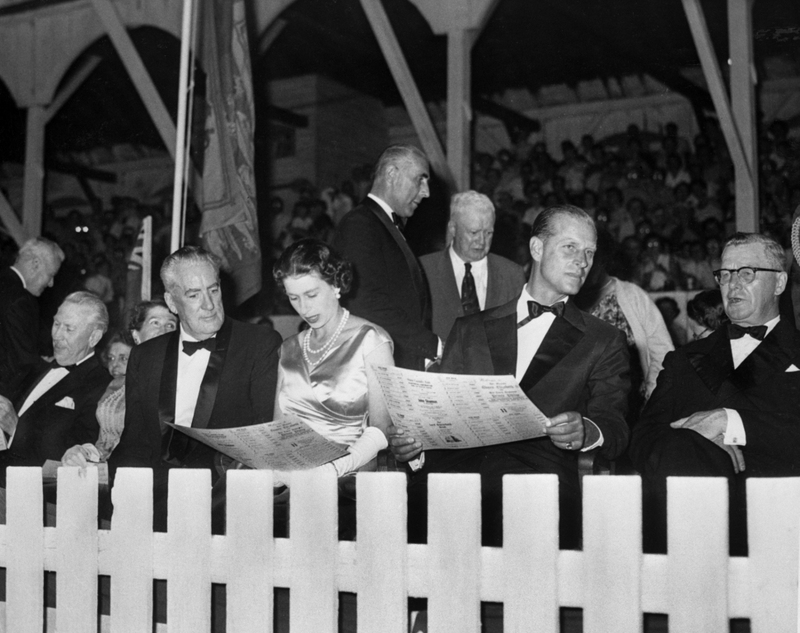 For instance, did you know that Queen Elizabeth II and Prince Phillip visited Fredericton Raceway on July 28, 1959 and witnessed their first harness race? Or that an estimated 20,000 people turned out on September 20, 1923 to watch a match race between the world’s fastest stallion (Single G), mare (Margaret Dillon) and gelding (Sir Roch) resulting in a two-heat record for the “Dominion of Canada”? As we reflect and remember this month the sacrifice which our veterans have made, did you know that the track was used as a training ground for soldiers from 1940 to 1945 and was known as the New Brunswick Training Center? One of the more fascinating trivia facts about Fredericton Raceway is that it recorded Maritime harness racing’s first miles in 2:05 or better (Single G, 2:04 ¾), 2:00 (Clipper Seelster, 1:59.3) and 1:55 (Shannon Commander, 1:55) on a half-mile track. 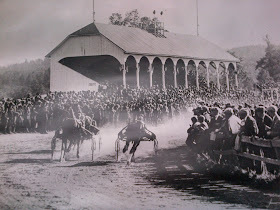 Horse racing in Fredericton actually had its first recorded race meet back in 1816 when locals used to race horses from Phyllis Creek (which is located in Odell Park) to the general area of what is now known as Brunswick and King Streets, close to where the track is located today. 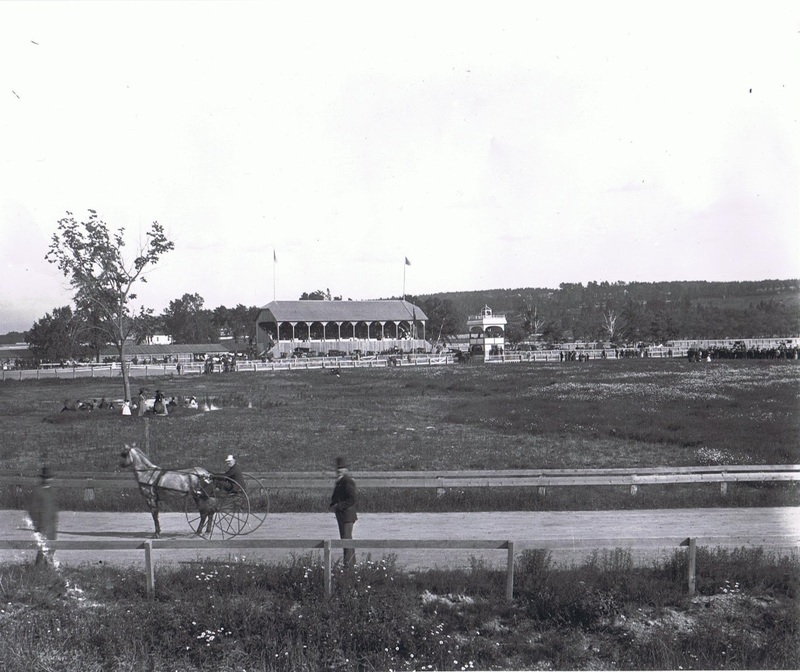 By 1863 Fredericton had its own one-mile racetrack for trotters, complete with a grandstand. The track was located above York Street, west of Aberdeen Street which today would include the old Hartt Boot and Shoe Factory building. The following was written about the opening. In the late nineteenth century harness racing was a vital part of the Fredericton community and it was common during Christmas and New Years of every year to stage road races from the Government House, running down King Street to finish at Church Street. King Street was kept plowed for these events and crowds of people would line the course for hours in the winter cold to catch their favorite horses in action. Although that level of popularity for harness racing certainly passed by many years ago, Fredericton Raceway has remained a vital part of the local community. Indeed as the City of Fredericton has literally grown around a racetrack that was once located outside of the city, the track has maintained a solid relationship with its citizens and can still attract significant crowds for holidays and special events. I was fortunate enough to have grown up and worked at Fredericton Raceway in the 1980’s and 1990’s when attendance was strong and wagering growths were regular. Even though it seems like the vibrant times of that period and those at the turn of the 20th century are now just a memory, the spirit of what made those days so great still remains 125 years later. It is the connection between Fredericton Raceway and the community. It is a love of the sport of harness racing by its dedicated people. As Fredericton Raceway celebrates 125 years, this is the first in a four-part series reflecting on the track and its rich history. Thirty years ago, on Monday, July 19, 1982, I was one of a few hundred people that were at Fredericton Raceway on a hot, humid evening and witnessed Clipper Seelster win a $2,000 Invitational Pace in 1:59.3 for Willard (The Wizzard) Carr, becoming the first horse in Maritime harness racing history to pace better than 2:00. Brent Briggs was the General Manager of Fredericton Raceway from 2003 to 2008 and also a long-time Race-Secretary in New Brunswick. He has also been a long-time race horse owner and trained Spudland Sierra p.6,1:52.1s, one of the fastest New Brunswick-bred mares. May 1816 – The first recorded meet in Fredericton took place. The races started at a large pine tree near Phyllis Creek and finished at Clark’s Corner (on King or Brunswick Street). 1820’s – A field located on a large area of Saunders field – south of George Street and west of York Street – and used as a recreational area, held meets where saddle racing and such contests took place before a formal track was ever laid out. This became known as the Fredericton Race Course. February 19, 1827 – Members of the New Brunswick Agricultural and Emigrant Society (also known as the York County Agricultural Society) voted in favor of holding a Provincial Cattle Show on the grounds of the Fredericton Race Course on October 9 of that year thus laying the foundation for a lasting relationship between the Fredericton Exhibition and horse racing. 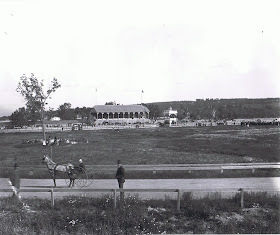 1863 – As plans for building the famous Exhibition Palace are being completed, the York County Agricultural Society gave Fredericton a one-mile racetrack for trotting races, a course for saddle horses and a grandstand to hold 500 spectators. 1873 – Harness racing first introduced to Fredericton. September 15, 1886 - When it seemed certain that a railway would be built across the Old Racecourse and it would have to be sacrificed, the York County Trotting Association subscribed enough money to lease about 20 acres of O’Dell Property and began work on a half-mile track. September 28, 1887 – The newly formed Fredericton Trotting Park Association (Fredericton Raceway) opened at its present location. Harness racing becomes a major player in sporting circles. 1890’s – During this time an annual tradition at Christmas was a race from Government House and down Brunswick or King Street ending at Church Street. Owners routinely exercised their horses on those streets and University Avenue. In 1891 five half-mile tracks were laid out and in January 1895 a track ran behind City Hall to the Mouth of the Nashwaak. September 23, 1903 – First 2:20 pacing mile recorded at Fredericton by Ituna in 2:19 1/4. July 28, 1920 – First 2:10 pacing mile recorded at Fredericton by Peter Farren in 2:09 1/4. 1920 – One of the greatest horses ever bred and trained in Fredericton, Bill Sharon, wins his first ever free-for-all race at his home track by taking two of three heats in 2:11 1/4 and 2:12 1/4. He was later sold to New York interests for $25,000 and went on to race on the Grand Circuit, taking a record of 2:04 ¼. 1922 – Fredericton Exhibition Ltd. takes over the Fredericton Park Association and assumed responsibility for the racetrack. July 19, 1923 – During this time driving clubs flourished and community owned horses were a civic boast. Four “community” horses, John R. Braden (Presque Isle, Maine), Roy Grattan (Caribou, Maine), Dan Hedgewood (Woodstock) and Jackson Gratton (Houlton, Maine) met in the $1,000 Barker House free-for-all in Fredericton. John R. Braden was a straight winner in 2:05 3/4, 2:06 1/4 and 2:06 1/2, a Canadian three-heat record for half mile tracks. September 20, 1923 – One of the greatest moments in Fredericton Raceway’s rich history came when ‘as great a trio of harness performers ever assembled on one track at the same time’ came to Fredericton for a $3,000 purse. Single G (1:58 ½), Margaret Dillon (1:58 ¼) and Sir Roch (1:59 ¾), the fastest stallion, mare and gelding of the time were brought to Fredericton by the Fredericton Driving and Sporting Club. It is estimated that 20,000 people witnessed the race. The result was Single G winning both heats in 2:04 3/4 and 2:05. The mile in 2:04 3/4 was a Maritime record while the times of 2:04 3/4 and 2:05 established a two-heat record for the Dominion of Canada. Fredericton Raceway was known as “Canada’s Fastest Half-Mile Track” at the time. 1924 – Horse racing in Fredericton reached an all-time high in popularity and local race fans decided to buy a horse of their own. With money raised by popular subscription, a group headed by City Hotel operator Bert Lint, purchased Chesley H. Searcy from Ohio. In his first race under new management, he equaled the world record for four-year-olds on a half-mile track in Houlton, Maine. September 22, 1927 – Ruby P equaled the track record of 2:04 3/4 in the final of four heats. She won three of those heats, also winning in 2:07 1/4 and 2:06 1/4. Bessie McKlyo won the other heat in 2:05. The four heats were a Canadian half-mile track record and a world record. September 15, 1937 – WALTER DALE, a bay gelding from the Sullivan and Mawhinney Stables of Machias, Maine establishes a Canadian win-race record for half-mile tracks of 2:02 1/2 – the Canadian record stood for 18 years – in the second heat of a junior free-for-all. Henry Clukey drove him. Fractions for the historic mile were 30 1/2, 1:01 ½, 1:31 ½, 2:02 1/2. Walter Dale also set the track record of 2:05 in St. Stephen two weeks earlier – a standard that will stand forever. 1940-1946 – During the war years there was no racing at Fredericton. The track was used as a training ground for soldiers, known as the New Brunswick Training Center. July 5, 1954 – First racing under lights. 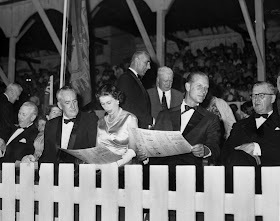 July 28, 1959 – Queen Elizabeth and Prince Phillip visited Fredericton Raceway and saw their first harness race. Abbeland won a special $1,000 race in 2:07 2/5. June 14, 1979 – It took over 40 years to break WALTER DALE’s track record but Daily Special, a roan horse owned by David Kileel and driven by Mike Downey, became the first horse to beat “the Ghost of WALTER DALE,” lowering the track record to 2:02 1/5. July 19, 1982 – Sub 2:00 speed was ushered into Maritime horse racing when Clipper Seelster wired the field in 1:59.3, the first time in history that the 2:00 barrier was broken in the Maritimes. Willard (The Wizzard) Carr drove Clipper Seelster to victory. June 26, 1993 – Shannon Commander became the first horse to pace in 1:55, which at the time was the fastest race over a half-mile track in the Maritimes. He was locally owned by Ashley and Joan Sloat. July 2, 2012 – The longest standing track record in the Maritimes was finally broken when Mcapulco and driver Brodie MacPhee won the Walter Dale Memorial in 1:54.2.